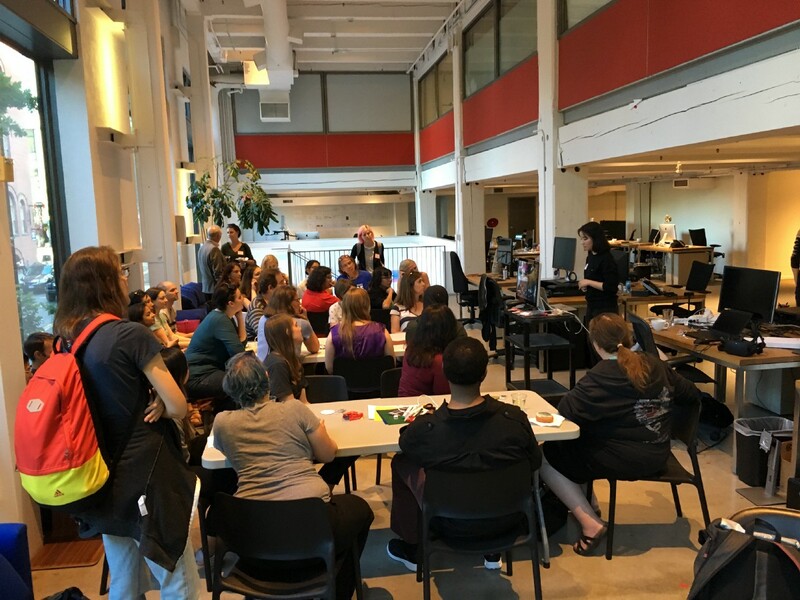 In July, we held another event in our monthly Networking Nights series, a speaker series that showcases women working in engineering, design, product, etc at different Portland tech companies. Every month, we have a different theme presented by the engineering talent at our hosting company. For this event, we showcased VR and LED Wearables. Wieden+Kennedy (http://www.wk.com/) sponsored the event, with their own female engineers leading both the VR/AR and LED wearable demos. The W+K Lodge specifically is a design engineering group that works creatively with technology. With experts in machine learning, interaction design, real-time graphics and other emergent parts of tech, The Lodge provided creative and unique exposure to technology many of our members had not seen before. We are so grateful for their support of Women Who Code and their sponsoring of this event. Attendees are gathered around for the Welcome and Intros portion of the night. The event began with introductions from the Women Who Code Portland and from the team at W+K Lodge. The demo leaders were Manxue Wang (Creative Technologist / Engineer), Jesica Marquez (Creative Technologist / Engineer), JiSoo Sim (Design Resident) and David Glivar (Engineer) and the event’s organizers were Lindsey Reightley, Lily Darby (Producer), Farin Nikdel (Content Coordinator) and Claire Wilson (Experience Designer). 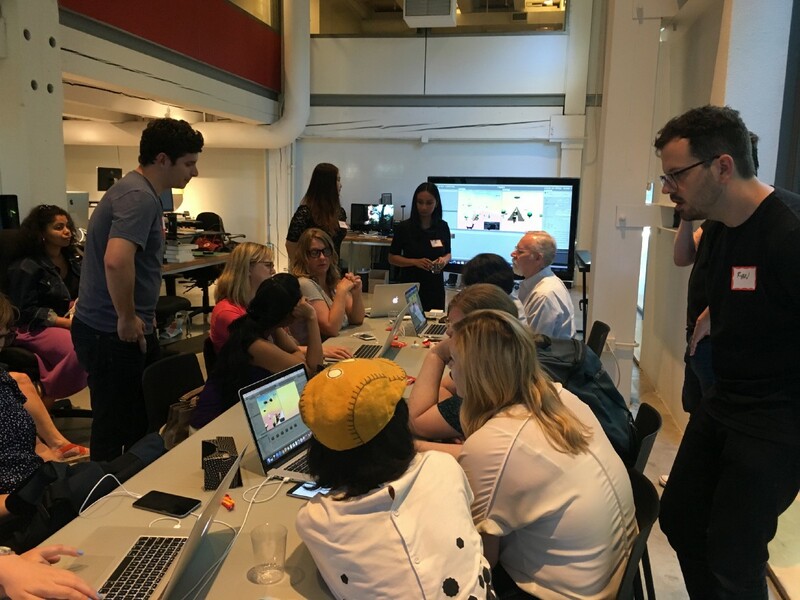 The Intro to VR Workshop, led by Jesica Marquez and JiSoo Sim, was a guided workshop that taught participants how to build their first VR app. The tutorial, run in Unity, was documented on video so that attendees can re-watch at home. A learning package was also prepared for attendees, which they can download online and use to build additional VR apps at their leisure. Manxue Wang led the second workshop, “How to make your own LED Jewelry & Soft Circuits”. Participants walked through an hour-long workshop on making LED jewelry and pins; as part of building their wearables, they learned how to sew soft circuits. In addition to the two main demos, the W+K Lodge also had two running demos of “No Paper,” a demo room of painting in VR using Google’s Tilt Brush. David Gilvar walked participants through painting with light and sound. We also enjoyed a Donut Photo Booth, set up and run by Farin and Claire. 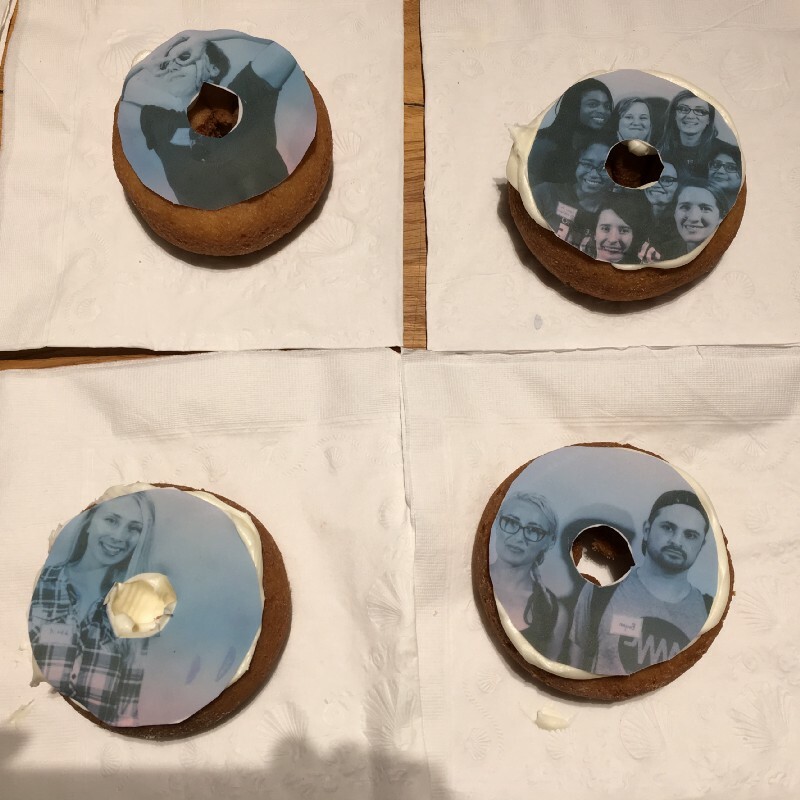 Spun sugar photos were taken live and printed onto frosted donuts, which participants could then eat. Thank you to Lindsey, Jes, Farin, Claire, Manxue, JiSoo, David, Lily and the entire team at the Lodge, many of who stayed late to volunteer! It was lovely seeing so many people enjoying this event. With around 130 attendees, this was one of our biggest networking nights! Many thanks to all of our attendees for coming, and special thanks to the W+K Lodge team for planning and executing such a spectacular evening. Our next Networking Night will be hosted by Vernier and it will be a workshop on how to ”Do What You Love.” In August, you can also join Women Who Code at Cambia Health Solutions for the Women + Tech Summer Soiree. For more information and to join our group, check out our Meetup page or follow us on Twitter (@wwcodeportland) and Instagram (@wwcodeportland).